Barneys New York is fashion house of an American chain of luxury department stores. Its headquarter is located in New York (USA). In 1923 first store of Barneys New York was opened by Barney Pressman in Manhattan. Products by this company are Footwear, Clothing, Bedding, Jewelry, Furniture, Beauty products and housewares. Its main branches are in Washington, Pennsylvania, Nevada, California, Massachusetts and Arizona but also famous in UK, Canada and Australia. Barneys New York is today one of the most demanding and stylish fashion wear house who produce luxury and best quality products. Women like to have accessories that are stylish, smart and trendy. So, here is the latest collection of handbags presented by a very well known fashion brand of New York called BARNEYS. It presents a beautiful and unique assortment of leather handbags for women. 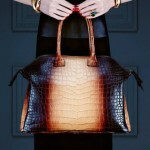 This collection is named as” Women Luxury Leather Handbags By Barneys New York”. The bag collection comprises of small clasp to all size of carriers. Some of them are simple while others are textured into many prints and forms. The colors presented are very trendy, bold and bright. They look very smart while being carried by the person. They give the convinced and bold look to the personality of the carrier. These bags are further ornamented by beautiful straps, zippers, small pockets, buckles, chains and locks of different kinds. Barneys is a very smart brand that understands the requirements of today’s fashion grounds and gives the exact beauty of accessories to its consumers. Moreover Barneys other accessory items are also very well known and admired all over the world. But here these lovely handbags are a big weakness for fashion loving women from western as well as eastern countries. Now let’s have a look on some handbags.